Morning glories, their tendrils spiraling along the fence, turn their faces to greet the morning sun. This trio of pretty white blooms will bring a bit of cheer to even the darkest corner - no natural sunlight needed! Approximately 5 x 5 3/4. 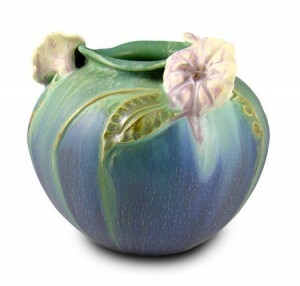 Available from Dard Hunter Studios in Aurora glaze..